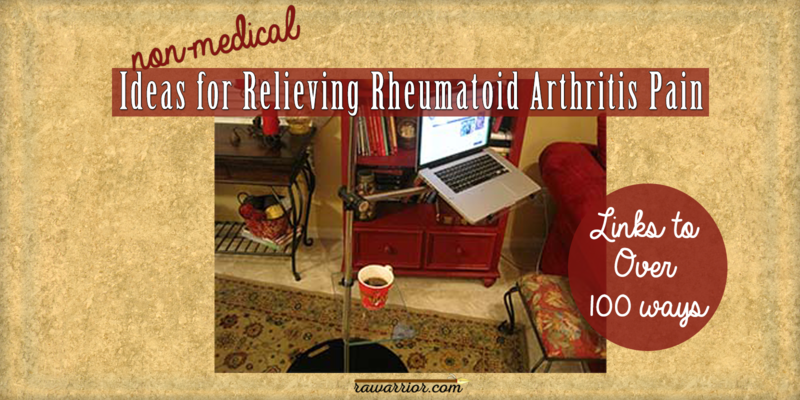 Please enjoy the blog carnival on Relieving Rheumatoid Arthritis Pain and list your favorite non-medical pain reliever in the comments box! As promised, this picture is my entry for the blog carnival! My mom recently sent me this laptop stand with mini shelves to hold a tablet or a cup of hot tea. This should make it easier on my neck when I have to work from bed. It may be used with the sofa as well – I’ll let you know! Thanks to Katie Beth and Tiger for assembling and photographing it for me today! Anyone shopping for you might be interested in reading what brings comfort or helps in relieving Rheumatoid Arthritis pain and disability. Over the past two weeks, we’ve collected a long list of things to bring relief from Rheumatoid Arthritis on the blog comments. Here’s a list of some popular answers and some special Rheum Helps Blog Carnival posts specially created to help us all find comfort! 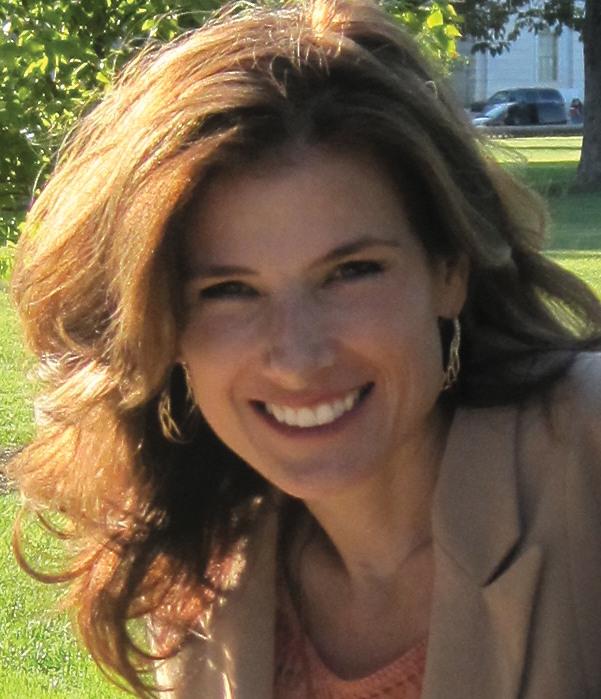 Most painstaking research: Lene’s post is a thorough discussion of Reachers, an extremely important device many people with Rheumatoid arthritis use. It’s amazing how little most manufacturers know about what disabled people really need. Don’t buy a reacher until you read Lene’s post at The Seated View. Most practical cup ever: Joan found the most practical cup ever (actually, thanks! to Joan’s sister). Check out The Essentials at her Life with a Flare for what else brings her relief. Most clever gadgets: I think you’ll want some of the things on Amber’s list at Journey to the Knot. 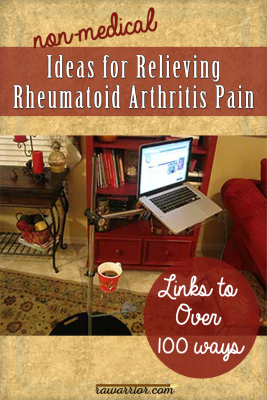 Easing RA Pain is a brief organized list of clever helps for pain relief. Most creative post: Connie at Reflections on Pain and Healing shares about her journey to learn ways to make her life easier and more comfortable. In One of my favorite things, she shows us how to make custom heat and ice packs. Two of my favorite things in one: heat and ice! Most candid: Neen at Arthritic Chick gathered seven favorite things in Rheumatoid Arthritis and non-medical ways to ease the pain. There will be some stocking stuffers there for someone. Exceptional effort: I’ve so enjoyed the photos posted by Elizabeth at Ancient Reptile. In My 10 Most Unusual Comfort Items, she shares ways she, her husband, and service doc have worked to make her life more comfortable in spite of Rheumatoid disease. Many thanks to all of the fantastic blogs who contributed to this carnival! I hope you’ll take time to visit and let them know by commenting. Update: The following entries were made after this page was published, but please do visit and read their valuable posts on this topic! 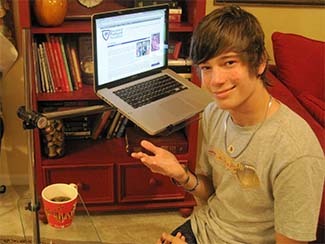 However the link to me to Amber’s blog. You’ve shared the difficulties you are enduring at this time so please don’t take this as a complaint. Just something to fix when time, pain and fatigue allow. Thank you for voicing what I can’t. I refers hubby to your site quite frequently! I had some problems with my copy paste last night – didn’t finish till 2 am so I think it’s fixed now. Out the door after I go brush my teeth – thanks for letting me know so I could fix it! Pampered Chef has a jar opener that I love so much I will bequeath to one select loved one upon my death. 🙂 Spa socks — warm and loose so they don’t put pressure on my toes. Crocs — really the only shoes I can wear. Melissa – I second, third and fourth your votes for Spa Socks and Crocs! I, too, cannot wear anything but Crocs. Certainly can’t go barefoot! i just posted some of my favorite things to help with living with RA last night. here’s the link to my gift ideas. http://momssmallvictories.com/gift-guide-for-rheumatoid-arthritis-patients/ looking forward to seeing what others posted. thanks for your support and advocacy of RA patients like me. What a great list. I have that OXO Good grips jar opener and I LOVE IT. it opens everything for me. The electric blanket is great, but the electric mattress pad is even better. I love to turn it on long before I get into bed, so I never have to get into cold sheets again. Ginger is excellent….my acupuncturist had me make Ginger Tea every day when I was going to him for pain relief. It really helped. So many good ideas here. Thanks. I found “Kyani”. A friend turned me on to it. Their products are all natural do no side effects! Their Nitro Fx is awesome I use it topically on wherever my joints ache and it relieves my pain almost instantly! I carry it with me every where I go . I take the drops three three times a day under my tongue also and it helps your blood flow which we all need that, I no longer have Neuropathy in my feet. So for pain and blood flow this is my favorite pick for pain relief! I start every day with pomegranate juice (a natural anti-inflammatory) and end each day making sure my hands are open (not clenched closed) before I fall asleep. I thank God for all the various soft items that can be put in the microwave to produce heat. I have them for the neck, the back, the knees, the hands, the feet, the shoulders…and I use them all at different times. Heat really helps with the pain. So does ice and when there is swelling involved I use it, too. I have told everyone I know who suffers joint or muscle pain to get these wonderful things and some of mine go with me whenever I take a trip! I just do not want to be without them. Can find at drugstores, Marshalls and TJ Maxx and many other places. Bob, you may have to go to a pain specialist! I am fortunate, and I know it. Both my rheum doc and internist are cognizant of the pain involved with RAD, and ensure that I have plenty of pain med. Just about whatever I wanted I could get, but I restrict myself to hydrocodone at this point. My prayer each night is that every RAD patient will have docs as great as mine are. Bob, try the Kyani Nitro Fx you take the drops and use it topicically. I don’t use any pain meds just this and it is natural no side effects. I am sick of being scared of what will happen to my kidneys or other organs if I take the medicines. Muscle pain – I use spray on Magnesium chloride or the gel. If you can find a warm-water pool too. Or swim in the ocean when weather is hot. The link to my blog post seems to be missing. Here it is: http://yourgoldwatch.blogspot.ca/2012/12/fairy-tales-of-ra.html. It was fun writing it. I think I’ll pull some of those fairy tales out for re-reading. I hope you and the family feel better soon. I have a very soft scarf that I now keep on hand to fold across my lap to rest my elbows on. My elbows hurt so much lately, I can hardly stand for them to touch any thing. I have done that too Rebecca. Very soft pillow like my lightweight stuffed eagle works that way – who would believe it hurts us to even hold our bodies in what we used to consider “normal” ways, like resting on elbows, hands on hips, etc. I love this website and am newly diagnosed. How can I find all 14 comments? I only see 10 and don’t see an arrow to get me to the other 4. The “replies” to specific comments count as comments but are not numbered. Hope that helps! I found it a bit confusing at first too. One of my favorites for wrist and hand pain is Wristies – http://www.wristies.com – which I put on before the pain starts. They also make one that you can put warmers in. such a terrific carnival, Kelly. Thanks so much for having this idea! My favourite ‘comfort’ items would have to be, in no particular order; my memory foam topper and pillow, also my v shaped pillow. My wheat bags for that much needed instant heat, my kindle which I adore as this allows me to read for long periods and all I have to do is gently touch the button to turn the page, no holding of books either as I prop it up. The sweet treats go without saying!! My cats who always know just which part to lie on and warm up and of course my wonderful family who know just what I need when I need it. Also for those more energetic baking sessions, as many labour saving utensils and appliances as possible, I adore my processor and am hoping for a Kenwood mixer maybe next year!! I’d also like to say a special thank you to my greatest source of daily comfort, that is my wonderful support group, I love you all & I know many of you will read this blog post. I highly recommend you hold out for a KitchenAid mixer instead. We tried to make do with a less expensive mixer but it failed completely on dough, which was a primary use we wanted. Sorry if I sound like a commercial but our KitchenAid has never let us down, nor has it let down anyone I know. Do look for a model with a heavy duty motor for best longevity. Your hands and arms will so thank you! Hi & Thank you for the work here! My very favorite pain fighter is my “Little Hot Water Doggie”, my Doxie, Hannah. She is superb at know when I’m really bad. I am usually in bed, with heating pad, soft, warm comforter & she gets in, heads to my feet or wherever & plasters herself to me…bliss! Other favorites, my HOT TUB!! !, which is the best & I don’t know how I lived without it! It is a small, oval one with slip resistant finish. Simple design, few jets, made for truly soaking. Most of the time, the jets hurt to much & I rarely use them. The other fave is the comforter mentioned above. It is a quilt, made entirely of flannel, with solid piece of flannel on the other side. It is quilted with medium weight batting, so it is not very heavy, but is lovely to warm up in. It was inherited & is very soft. We just refurnished our home with lever style handles on all the doors & It is such a relief! I would have never imagined what a difference that made. Thank you for posting all of the ideas! I am going to slowly check of each & every one! Dealing with pain is tough so you need something that stands alone try this. My favorite purchase in the last year are battery operated peeper and salt grinders. I love fresh ground pepper on everything. It was becoming increasingly difficult to use the old ones and creating more hand/wrist pain. My husband got the pepper one for my birthday from Williams Sonoma and we later added the salt one. Love them! Those battery operated grinders are a “must have” in our home. Need to purchase a new computer and thinking about a “touchscreen”. 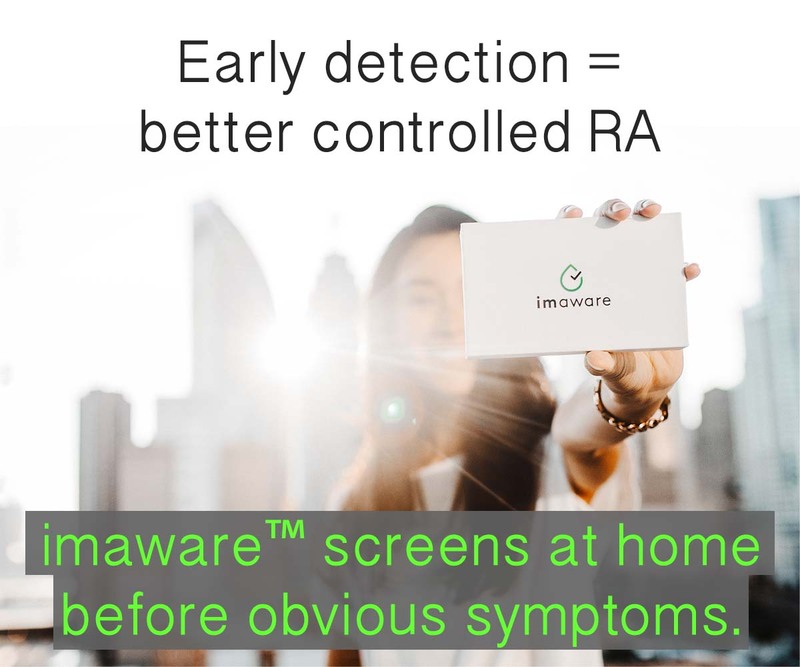 I’m wondering if other RA patients have any experience with this technology? Concerned about moving arm/shoulder back and forth to touch screen. I find my Ipad great for browsing ( very litle movement required, i surf without moning more than a finger) but not great for typing…. One of the good way for relieving pain in non-medical way is by exercising regularly for half an hour and doing a bit of stretching to allow the muscles to strengthen and maintaining the healthiness of the joints and Epsom salt bath is also an aid in reducing the pain. What about stem cells therapy, have you looked into this kind of treatment? it seems to fix, not just patch or diminish health problems including arthritis. I have a friend who works for a Stem cells clinic in Mexico and she told me they have great results for many degenerative diseases! What are your thoughts? My bladder started working again! Hello, I am Jessie. I didn’t list a website because my website does not deal with RA. This is me reaching out to whomever can help me. My family dr says that I have to see a specialist to have my bones recalcified. My dr says that in my case I should have been placed on hormone pills after my hysterectomy, I have been without hormones since June 2001. I am 41 years old and have pain pretty much everywhere. Family dr says that I have rheumatism. Bone density scan tells my dr that I am about a 70 year old woman. How depressing can that be to hear? I suffer from fatique, sore and stiff joints, pinched nerve and osteoporosis, my SI joint is somewhat out of place but it is recommended for me to not see the chiropractor. The chiropractor helped me before when other dr’s had no clue. However, I ask my dr for pain meds when the pain begans to consume my thoughts. I use hot baths with a half bottle of 91% rubbing alcohol and 2 cups of epsom salt before bedtime, sometimes I just sit in plain hot water to get get relief, the thermocare heat wraps and pads are absolutely wonderful and sportsrub in the turqoise and black tub is fabulous also. It calms me where I can lay in bed and fall asleep. I can’t get to sleep when I am hurting more than usual. I have pain everyday, been this way for a few years now, having poor insurance doesn’t help. Where can I go to vent my anger towards whatever ailment this is that I have? LOL….but very serious. I know that people suffering like me can help me better than any psychiatrist can. I love all you and stay enclosed in prayer until your Angel comes. 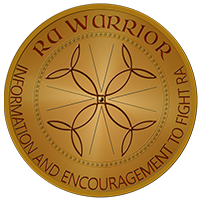 I have been reading this site with a lot of interest as I have had RA for 15 years (severely), literally woke up one morning with bend fingers, toes & in agony. Methotrexate mucked up my liver so had to come off that after 1 year, tried various other drugs but ended up in wheel chair & couldn’t do anything. My husband had to wash/dress me whilst working as well. I was lucky enough to be on the 1st list for Enbrel & after waiting 3 months for funding I was no. 38 in my trust to get it. I inject myself & within 3 days was out shopping!! It’s not perfect by any means & as the years have gone by I have got worse but I am still mobile which is the most important thing. Anti-tnf doesn’t work for everyone, but it works for me. I also use Bio-freeze for when the pain is bad, also heat pads as well. I also take low dose prednisolone (5mg per day). Need paracetemol as and when I need it. Hope this helps & that none of you ever give up. Keep pushing for these drugs they do help. I use Two Old Goats and other similar creams and lotions massaged on my hands each night. Massage, massage, massage…I get a full body massage 3 times a month and it really does help so much. I take the meds as prescribed and add Aleve twice a day..sometimes double doses. I use heat packs that go into the microwave and ice packs I keep in the freezer….I have dozens of each in every size. I also have a TENS unit that I have used when I have really awful pain…learned about it in PT for hip bursitis…and it does help. I wish that I had access to Marijuana because I know from past experience that it works on pain and inflammation better than most anything else. But I do not live in an MJ state.Ohio claims to have legislated MJ for medical use…but they have not allowed anything to be done with it and it will be many years before they do. I water walk three days a week for an hou and a a half and I exercise with Gilad’s Bodies in Motion on TV three days a week for half an hour. All in all it is a full time job to keep away the pain of RA. And even all this does not do a full job! OK don’t laugh but I settle myself comfortably on the sofa with pillows and blanket and watch Hercule Poirot – Miss Marple or something similar. My son or husband bring me a lovely cup of turmeric ginger tea and I just splodge! Sometimes it’s wine if I choose to avoid pain meds ? Mustn’t forget to mention my little Jack Russell who curls up next to me. She seems to know when im really suffering bless her.